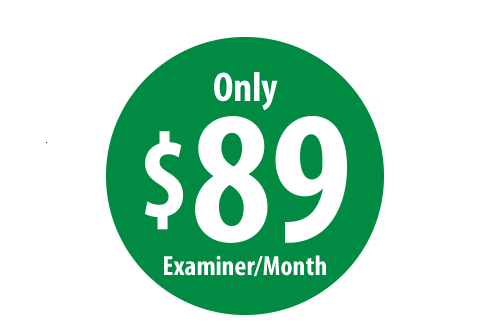 Complete the form to get a ChiroTouch $89/Month discount code for DOTTester®. The total exam solution for certified medical examiners performing DOT exams. Use any PC, laptop or tablet to easily complete Medical Examination Reports, view, print and transmit electronic Medical Certificates. DOTtester® powered by 3bExam will automatically transmit data to the DOT for each completed exam. DOTtester® automates the manual data entry procedure. We report results for qualified, disqualified and "no exams performed" to satisfy the FMCSA requirement. I'm Ready to Save Money! You will be redirected to 3bExam.com to finish your request. 3bExam is the industry leading, browser based, electronic exam management solution. Designed specifically for DOT Certified Medical Examiners, we have over 1,000 satisfied customers, and we are the first and only solution to automatically report results to the FMCSA. We love 3bExam. 100% of the companies we work with have converted to the Client Portal. I wish every software program we use ran as smoothly as 3b. Complete your standard forms electronically using any browser. DOT physicals data is automatically uploaded to the FMCSA quickly and accurately keeping you in compliance. 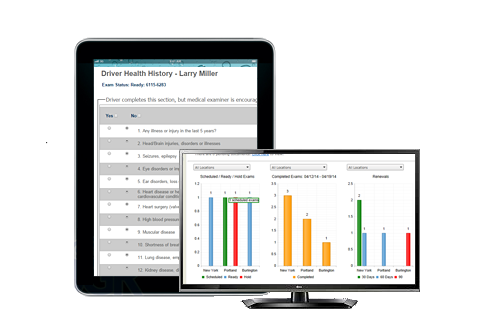 Drivers can complete their initial medical questionnaire in the comfort of their home, workplace or where they have internet access. Document Management - Store all of your completed documents and forms types in electronic packets for each employee, driver or patient. Simply scan and upload the paper forms and related documentation using our bar code separator sheets. Documents are kept in our secure cloud for easy search and retrieval anytime you need them. No more paper files and folders necessary. Revenue Management - Run reports, retain complete history and audit trails and export data and billing information for all of the services you perform. You can even send reminders and notifications to employers, employees and drivers to get appointments scheduled before certifications expire. Improve your customer service and reduce administrative tasks required to manage client requests. Easily share detailed employer services information with the companies you have contracts or relationships with via the web. Secure access to DOTtesterÂ® powered by 3bExam allows your clients to manage lists of employees, edit employee information, request appointments, see status or results of exams and testing, view forms, and print documents. © 2016 Integrated Practice Solutions Inc., DBA ChiroTouch. All rights reserved. In partnership with 3bExam.